01. Give him up (Liz McComb) 04'07"
02. 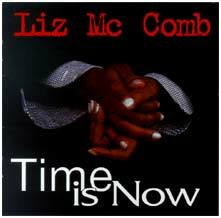 Time is now (Liz McComb) 04'54"
03. You can't hurry god (Dorothy Love-Coat arr. Liz McComb) 02'47"
04. Give me patience (Liz McComb) 04'19"
05. Prayin' (Liz McComb) 05'58"
06. What happened to the love (Liz McComb) 04'33"
07. Whenever you pray (Liz McComb) 03'27"
08. The voice of the Lord (Psaum 29) (Liz McComb) 03'13"
09. Jesus is a rock (Trad. arr. Liz McComb) 05'10"
10. The rich man (Liz McComb) 04'31"
11. Sinner please (Trad. arr. Liz McComb) 05'44"
12. Song of freedom (Liz McComb) 07'30"